As a real estate agent it is your job to manage and organize multiple different leads. You could have anywhere between a dozen and hundreds of different leads, all coming to you from multiple sources. This can make managing them a difficult and confusing task. If you allow this type of practice to last for very long, your prospect will soon become your competitors’ clients. 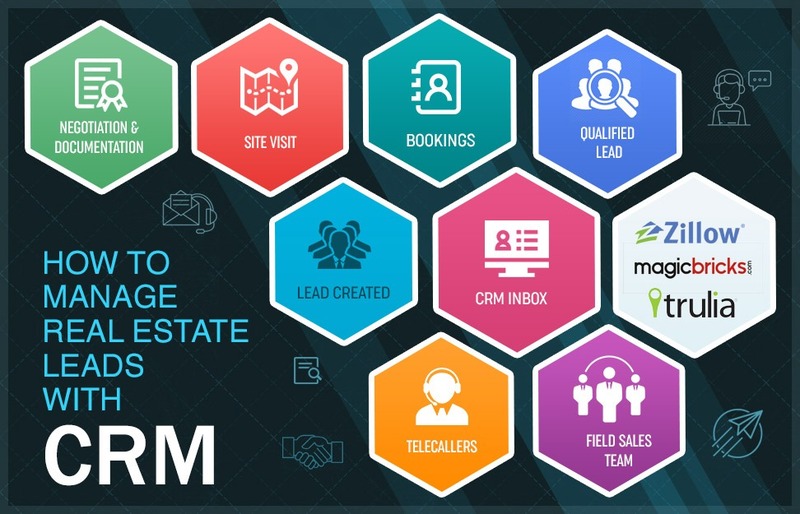 This is why it is essential to use real estate lead management CRM. This simple software solution will capture all of your leads in one place. Providing you with in-depth information in an easily digestible manner. Your potential clients can come from a rage of different mediums and channels. From leads coming directly through your website to responses to emails and social media adverts. A good real estate lead management system allows functional lead tracking from all these different sources. Potential customers will become leads at different points of the sales journey. Some will just be browsing thinking that they might one day soon wish to purchase a property. Others will know that they want to purchase but be unsure of what sort of property they are looking for. Others, still, will know exactly what they are looking for and be ready to complete a sale as soon as they find the right property. Using the correct lead management tools allows you to quickly prioritise leads so you can convert them into customers. The lead management solutions that you use should be able to organise all leads by their specific datasets and then into specific subcategories that align with your sales funnel. Your CRM will contain information about how many properties were viewed, in what price range, where those properties were located and how many bedrooms and bathrooms they were looking for. Once you have all this information collected in one place on your lead management platform you will be able to track these potential clients through every stage of the sales journey. This allows you to quickly and efficiently respond to new leads. If a customer is merely browsing thinking of purchasing a new property some time in the future, a regular drip email campaign can solidify your brand in the customers mind, making you their first call when they are ready to make a purchase. A customer further along on the sales journey can benefit from a direct call from your sales team, instantly turning that lead into a client. Dealing with a high volume of such leads can be a time consuming task. Your lead management software can automate tasks such as, responding by email or setting appointments. It can also allow you to add notes to the lead’s file or contact them by text or phone call directly through the CRM. This makes lead management much simpler, so that you can concentrate on closing the deal. Automation is not limited to merely a slow drip email campaign. It can also be used to synchronise various leads. If your brokerage is advertised through various different channels, it is more than possible that the same lead will come through from more than one source. Replicating marketing strategies for duplicate leads is not only inefficient, but it can also be off putting for potential clients. Your CRM database will automatically conflate these leads to prevent that from happening. Once you can clearly see the number of leads that you have generated you can begin to organise them into a hierarchy, knowing which ones require your attention soonest. This level of organisation and automation can allow you to categorise your leads and apply the correct sales funnel to each of them. Doing so will save you time as well as improving you lead conversion rate. Turning prospects into clients often comes down to one thing – nurture. All leads by their very nature have some interest in using your agency, to turn that interest into the fact of a client signing a contract requires you to nurture that lead. Personalised email campaigns can be a fantastic and cost-effective way to do that. Your CRM system will allow you to track campaign analytics such as open rates, forwards and unsubscribes. This allows you to know which pieces of content are really connecting with your customers. 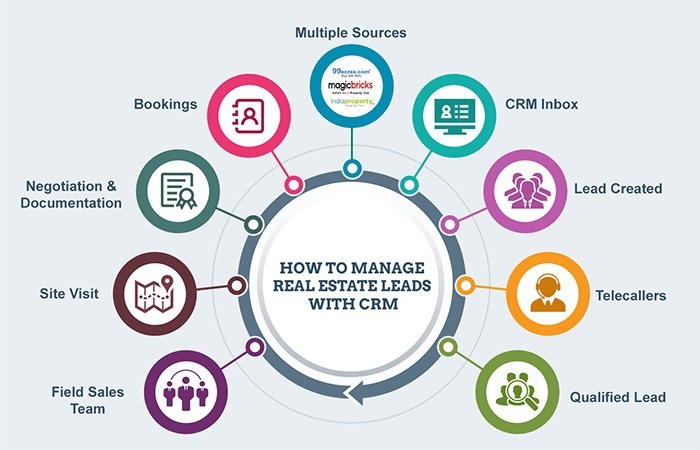 With all of your leads carefully organised in your real estate lead management CRM you are in a strong position to analyse you marketing campaigns and lead capture techniques. Using free online tools such as Google Analytics will help you see how much traffic your website receives and how often that traffic is generated into leads. Data and insights on capturing leads and responses to marketing campaigns will allow you to quickly tweak any weak points in your process. It may be that the content you are using is not connecting with your audience or it may be that the categories you have put different leads into are not appropriate. With all that information readily available changes can be made painlessly to enhance your conversion rate. The initial process of setting up a real estate lead management online system may take some time, but in the long run it will save you much more time. Without having any form of CRM that can pull leads from multiple channels, potential clients can all too easily fall through the cracks. Even if you are able to avoid this worse case scenario the time spent on managing and filtering new leads will be astronomical. With a well-organised and easily accessible database of leads you can greatly increase your productivity and capitalise on any leads that you are able to attain. The reports and insights generated by CRM can help you to guide potential clients on their sales journey from prospective to customer. Instead of having to look through multiple files and pull information from various sources, everything you need is right where you need it, when you need it. Making the process of lead conversion much smoother and more profitable.